Sinningia concinna (top) can grow comfortably in a pot the size of the flower cup in S. speciosa. Although floral diversity in Sinningia does not match that of Columnea or Drymonia for instance, the diversity in this alliance is expressed in different ways. The “unifoliate” plants discussed under Habit are one example. The dramatic markings exhibited by some species, especially in young plants of S. reitzii and S. sp. “Pancas” are another. Other examples are the size ranges mentioned in the introduction; the attractive silvery hairs of S. leucotricha and S. araneosa; the dark foliage of S. eumorpha and S. helleri; and the bubbled foliage of S. bullata. 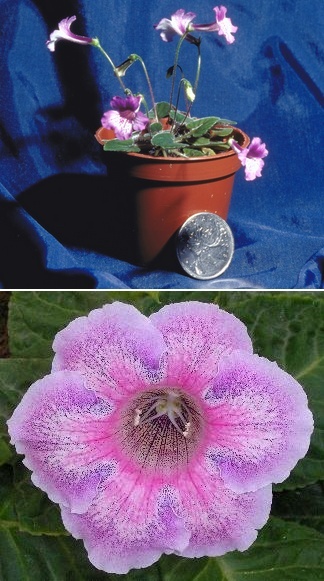 Especially noteworthy, and unique in the Gesneriaceae, are the appealing range of tuber types, from the textured tubers of S. ramboi and S. gigantifolia to the symmetry of S. piresiana, to the amorphous lumps of S. cooperi. Last but not least, we have to mention the large peloric flowers of S. speciosa hybrids, many of which are multi-colored and spotted. S. leucotricha (left) has beautiful soft silvery hairs which contrast beautifully with the bright orange flowers. S. macrostachya produces an often-enormous tuber, which in this instance is more than a foot across! The above-ground tubers of many Sinningia species are prized by growers of cacti and succulents.